David Duchovny and Gillian Anderson are back reprising their roles as Fox Mulder and Dana Scully. This special edition, season 10 will focus on a new major investigation that questions the US government’s involvement with alien abduction. A new speculation arises as Mulder and Scully learn that what they already knew about alien abduction in the past could change the future of what it really means to be human. While Mulder and Scully uncover the truth, they will undergo a series of strange investigations that will lead them on a new journey into the world of the paranormal. So far, my love and excitement for this show has grown even more. It it bigger and better then ever. The story-line did not disappoint. The effects were great and I love the on screen chemistry that Duchovny and Anderson share. Another aspect that I really like is the open window that Carter creates for the audience which gives us a chance to see the past life that Mulder and Scully had as a family. The new season will only feature six episodes and is back by popular demand. I am hoping that Fox will be ready to sign on to future seasons of the show. After 13 years of being off the air, the show’s ambiance feels as though it never went off. As we embark upon the new age of paranormal and extraterrestrial intrigue, the XFiles does nothing but open the doors to the real possibility that the subject matter is no longer considered science fiction but instead should be considered science fact. The Amazing Spiderman 2, starring Andrew Garfield and directed by Marc Webb was truly AMAZING! This was one of the best superhero movies I’ve seen. Without giving too much away, I will say that the movie is a continuation of the first film. What really makes this movie a first rate action film is the storytelling aspect. The writers focused on delivering Peter’s story in such a way that fully explains Peter’s connection to OsCorp and his real reasons for becoming Spiderman. The rise of Electro and The Green Goblin were elements that added to the film. Andrew Garfield did a wonderful job reprising his role as The Amazing Spiderman, but Jamie Foxx’s portrayal of Electro was just outstanding. I had the pleasure of experiencing the film in 3D and it was such an entertaining experience that I will never forget. Electro made the movie. Foxx aka Electro is now on my list of the top 5 Superhero villains of all time. The action scenes were superb and I felt like I was in the film living every moment as if I were one of the characters. This movie is definitely an engaging film with no dull moments. The love story between Peter and Gwen was also nice, but it wasn’t an overwhelming element. Each mini storyline fit to the overall bigger story and came together very nicely. Even the Green Goblin’s story was interesting, and the whole story behind Peter and Harry’s past unveiled some very engaging plot outlines. OsCorp is the corporation of the future, but all things intended to help mankind don’t necessarily end in success. 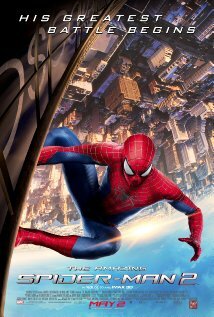 I hope an Amazing Spiderman 3 is in the works. The special effects were out of this world, the scenes with Electro in the heart of Times Square were so authentic in its presentation. Also the scenes where Spiderman is above the city jumping from building to building were also amazing. I was completely swept away by this film. The score was another element that was outstanding. The music played an important role, which kept the flow and mood of the movie in ways that increased the dramatic effect of the film. It connected to the emotion of the characters and impacted the audience in a way that drew you into the movie even deeper. Peter’s adventure is just that, a great adventure that you will want to experience. Overall I gave this movie 5 stars and highly recommend that fans see it in 3D. Spending the extra cash is worth it. The Hobbit: The Desolation of Smaug directed by Peter Jackson was absolutely Amazing!! The movie goer is immediately sucked into Bilbo’s adventure. The film opens with Gandalf and the Dwarf King Thorin meeting at the Prancing Pony, a familiar place that all fans reconigize from TLOTR. The film moves quickly as Bilbo and the Dwarves continue their journey to The Lonely Mountian. On their journey they meet friends, and foes, and embrace many challenges along the way. The great evil that lurks in the shadows is introduced and Gandalf battles the evil to some degree. We are shown the power that lies within the gray wizard. The Woodland Realm Elves make their mark, as so many other story elements are revealed. The on screen presentation of The Dragon Smaug mentally and creatively altered my imagination. Every aspect of this film demonstrates a form of creativity that I have never seen or experienced before. The actors, special effects, score, writing, and director was spectacular! Peter Jackson is a creative genius and should be considered for a life time achievement award in film. This movie is a must see. Jackson and Tolkin has elevated the fantasy genre to such a degree that I don’t think no one else can top. I give this movie 5 stars! I’ve got to see it again OMG! Swept into the Darkness: Chronicles of the Celestial book one is an urban fantasy adventure that introduces the world to a beautiful character named Sydney London. Sydney has always had special powers, growing up with these abilities she never really believed that her powers were real until tragedy strikes. As she deals with the trials of her life, she realizes that the powers she has are real, and that she is part of the war between heaven, hell and earth. Sydney’s struggles to live an ordinary life, but the more she struggles to be normal, the more she drifts off into worlds beyond the realm of her reality. Swept into the Darkness is in the process of being re-edited. The re-editing is almost complete, and the book will be re-released. Following the release will be a book tour hosted by Promotional Book Tours. I will also do a Goodreads promotion, and will have various giveaways during and after the tour. Complete details will be announced. My debut novel Swept into the Darkness: Chronicles of the Celestial book one is currently being re-edited. After the book is complete, I will re-publish the book, and start the promotion process all over again. I will host a book giveaway and have a book blast followed by a tour, hosted by Promotional book tours.com. I’m also working on the finishing the second book in the series Dark Betrayal, which is expected to be released early summer. I had to push back the release date for Dark Betrayal because of the re-launch of SITD. The cover for book two has been finalized so there will be a cover reveal event announced soon. Addition book updates will be posted.